Toyota Celica Alternator Repair at your home or office. Toyota Celica Alternator Repair costs $246 on average. How does an alternator help your car run? The alternator is the component that charges the battery in your car. When you use electrical components in your car (stereo, lights, etc. ), the battery loses power. The alternator recharges the battery, replenishing the lost battery power. The alternator is located in the engine compartment. If the alternator is not working properly, your car will only stay running for as long as the battery has power stored. Once the battery loses power, your car will not start. Normally, a malfunctioning alternator will turn on the battery warning light or will have a low volt gauge reading. The mechanic should check the entire charging system before installing a new alternator, including checking battery cables for corrosion and the condition of the battery. Inspect entire charging system (battery, cables, alternator). 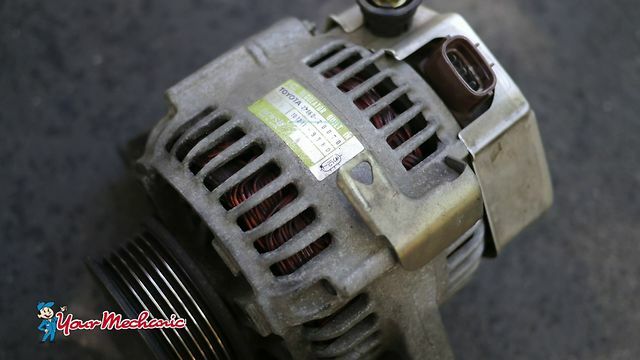 Remove and replace alternator if found to be faulty. Ask your mechanic to inspect the condition of the charging system during every major service. The mechanic should also clean and tighten the battery cables during every major service. What common symptoms indicate you may need to replace the Alternator? Dead battery or battery will not hold a charge. Battery warning light is on. Your alternator charges your battery, which powers the electronics in your vehicle, such as the radio and the air conditioning. The battery is also needed to turn on your vehicle. A malfunctioning alternator will not charge your car’s battery, and your vehicle will eventually run out of battery life and not be able to start.